I am so sorry and apologetic. Today is April 2nd and honestly when I read your letter I got the impression that it was a long way off. Then I dashed off to Baltimore for a big Goucher rally to save our poor college and when I got back the letters had piled up so that I succumbed with only a gasp and have just gotten back to my desk. I couldn't have come any way because tomorrow I start for St. Louis for another Goucher meeting. The college is in desperate straijhts and if we haven't a million by day after tomorrow we are lost and must close up for good at the end of this year. I am glad Beta Sigma is progressing. It made me very happy to vote in Student Committee Meeting that it be recommended for affiliation. Miss Butler felt that the new school constitution was much to be preferred but in view of the many circumstances there she was satisfied. Please give my loving remembrance to all the Beta Sigmas for indeed I feel as if I belonged to them and tell them how sorry I am that I have acted so. 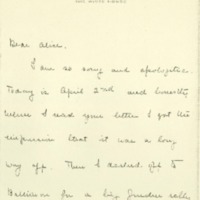 Sayre, Jessie Woodrow Wilson, 1887-1933, “Jessie Woodrow Wilson Sayre to Alice Appenzeller,” 1913 April 2, WWP17462, Jessie Wilson Sayre Correspondence, Woodrow Wilson Presidential Library & Museum, Staunton, Virginia.